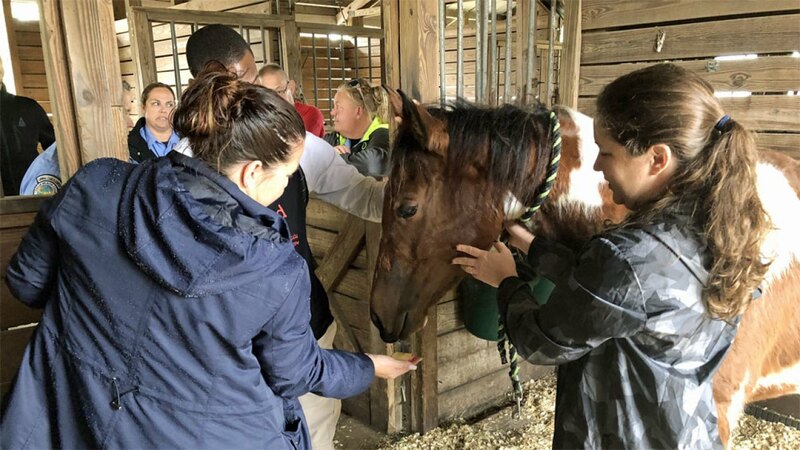 Palm Beach County Animal Care and Control reports horses seized from private property in Palm Beach County on February 8 are making major improvements after arriving hundreds of pounds underweight. They’re now in good condition after weeks of de-worming, proper nutrition, quality grain and hay and expert veterinary care. ”Just time to put the weight back on and get to the healthy body condition,” said Palm Beach County Animal Care and Control Capt. Dave Walesky . It was a very different sight last month; a joint effort between the Palm Beach County Sheriff’s Office and Animal Care and Control resulted in the seizure of all sixteen horses from a Loxahatchee boarding facility. They were neglected and in poor condition, officials said. Following a March 15th hearing and civil case against Joseph Schoneman, Lisa Schoneman and Kathy Long, the three voluntarily surrendered the horses and agreed to pay the costs for rehabilitation. ”They would pay us for restitution and they would agree to not own horses for a minimum of two years and we’ll be doing periodic inspections to ensure compliance,” Walesky added. As for the horses, officials say they’re up for adoption. A state investigation is ongoing. Capt. Walesky estimates the cost to rehabilitate the horses is approximately $15,000.